Every year as the Sockeye season of the fraser river of British Columbia, Canada approaches, the anglers of the Fraser valley literally get whipped into a frenzy in eager anticipation. 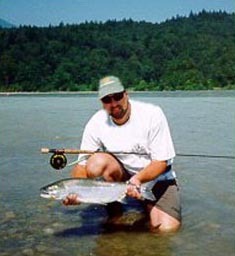 Bottom bouncing is far and away the most popular and admittedly the most effective method of angling for Fraser River Sockeye. Bottom bouncing however is not the only method available. Anglers who are looking for something new and maybe a little more challenging should consider chasing Sockeye with a fly rod. This season (July/August 2001) looks like a perfect opportunity to fly fish. The last couple of seasons we have had to contend with two disadvantages, one is the high water level, which is not conducive for fly-fishing, and the second reason is smaller run sizes. This season however, looks like the water levels should be excellent and the run is forecasted to be very strong. Many anglers already fly fish the interior lakes for rainbows and have fly fishing outfits that are suitable for that, but if you are looking to fish swift rivers such as the Fraser for powerful and acrobatic fish such as Sockeye then its time to invest in a new set up specifically for this fishery. Stout 9 to 9.6 8wt and 9wt fly rods with large capacity disc drag reels are required to deal with the fish and the environment that Sockeye live in. Fly lines are a topic of much confusion when it comes to any type of fly-fishing and this is no exception. To fish not only in the Fraser River but any river with Salmon and Steelhead you must have a line system that gets you down to the bottom of the river. The problem with rivers however is that every spot is just a little different and this requires a different line combination. This could get expensive and complicated as specialty sink tips and factory shooting head lines run about $65.00 each. Thankfully the Cortland fly line company has developed a line system called the change-a-tip fly line, which consists of a running line and four changeable tip sections including a floating tip, a clear slow sinking tip, a type 3 sink tip and a fast type 6 sink tip. Basically this is four fly lines in one, they even include a wallet to store you different heads in that fits conveniently in a pocket. For really fast water I would add a 450 grain and a 550 grain Cortland kerboom lead core shooting tapers as well, these heads come 30 ft long and need to be cut back to about 17ft to make them manageable to cast. Heavy shooting heads can be a little difficult to throw but in waters like the Fraser they are necessary to get to the fish. With the line system previously described you are outfitted for practically any situation you may encounter regardless of what river you are fishing on. As with any type of fishing much debate is about the bait or in this case the fly, well quite honestly it's not a big deal. The fly should be fairly well weighted and for the Fraser it should be mainly green in colour, the rest is up to your personal preference so don't worry about it too much. Sockeye that are available to the fly fisherman will hold in water that is a brisk walking speed and is 3 to 6ft in depth anything deeper or faster is not good fly water. Sockeye will also porpoise and role from time to time as they move up the river. This lets you know that they are present. Most anglers are content to hook their fish bottom bouncing and this is well and good but fly-fishing for Sockeye in the Fraser River adds a new and challenging dimension to this incredible fishery that we have right off our front doorstep, not only that but this can also be used as a springboard to fly-fishing in other rivers for other species of Salmon and also Steelhead. This summer may be just the opportunity you have been looking for to step up and try something new, fly-fishing for Sockeye. Who knows what it just might lead to?